Inventory security can depend as much on storage techniques as it does cameras, guards, and other traditional security methods. The way you store and handle inventory is critical to its security, especially in a warehousing or production operation. The more organized your storage systems are, the more secure your inventory, tools, parts, and equipment. The great news is that you can maximize inventory security while improving operational efficiency because material handling can make security and efficiency work-in-hand. In an industrial environment, most employees aren't thieves, but most thieves are employees or other trusted visitors. Material handling and smart facility layout can't replace careful hiring and conventional security systems such as monitoring, locked doors, or guards, but it can make them all better. 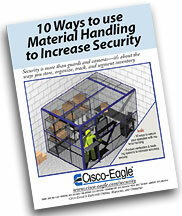 That's why we created this fast-read, free download, "10 Ways to use Material Handling to Increase Security." It has common-sense tips on storage, plant layout, automation and accessibility you can implement to make your operation more secure at minimal cost for maximum gain. Security is often enhanced by controlling access, organizing storage, increasing accuracy, and creating visibility -- all things you can accomplish through material handling.